There are many great ways to cook a turkey, but the best is smoking. The number one thing you are going to need is time. Smoking is a slower cooking process than roasting so make sure to read through the whole process before starting and do the math to get the timing right. It is a good idea to have everything mapped out well in advance. The results will be worth it. 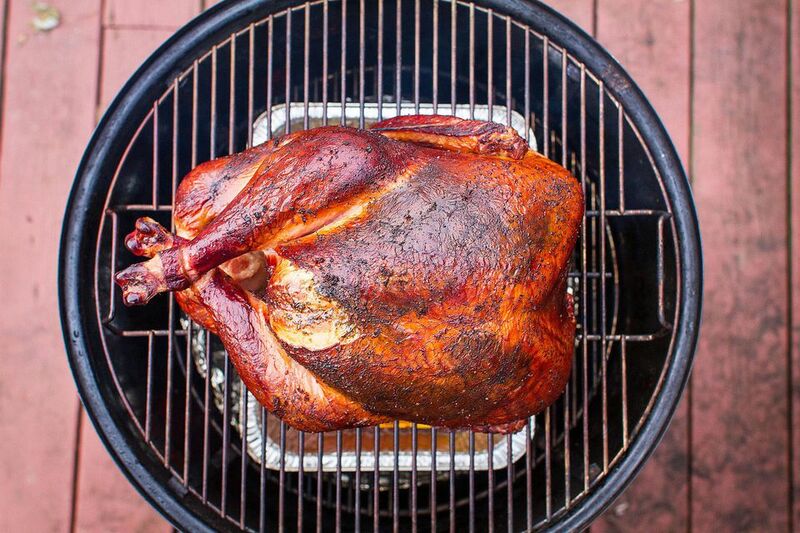 Smoking a turkey isn't a quick method, but it is amazingly flavorful. It requires a cooking time of about 30 minutes per pound at a cooking temperature of around 235 F/115 C to get the bird cooked through. Make sure that you build your fire accordingly. However, you can smoke your turkey at 250 F/120 C to reduce the cooking time a little. Plan on 25 minutes per pound at this temperature. This is a better strategy for larger turkeys since it reduces the amount of time that bacteria can potentially grow. Lightly oil your cooking grate. As you get the turkey ready, keep an eye on the smoker and make the necessary adjustments to hit the target temperature. A turkey over 20 pounds/9 kg will take a long time to cook. During this time, bacteria might get the upper hand and spoil your bird. I would suggest that if the turkey weighs over 15 pounds, that you cook it at 250 F/120 C.
If you plan to make gravy and need to catch the drippings from the turkey as it cooks, then place a pan under the bird. Use a disposable aluminum pan that is bigger than your turkey. Pour about 4 cups/1 liter of water into the pan to prevent the drippings from drying out and burning during the smoking time. Most of this water will evaporate during the process, so check on it late in the cooking time to make sure there is still water in it. Add more water as needed. If you are not using a smoker with a water pan, this pan of water will help add moisture to the smoking chamber. For poultry, it is a good idea to smoke in a moist environment. Prepare the turkey by removing the neck and giblets from the inside. If the turkey is brined, make sure to rinse it off thoroughly. If not, rinse the turkey anyway to make sure it is good and clean. Inspect the bird for both freshness and loose pieces that need to be trimmed. The wings of the turkey tend to dangle on the sides. To prevent them from overcooking and drying out, pin them to the body of the bird with a toothpick. It is also a good idea to take the skin from the neck, fold it and pin it down with another toothpick. A tightly packed bird is a good idea, but there isn't much need to worry about the other parts. Before the turkey goes in the smoker you will want to add some flavor to the bird. This is best done with a spice rub. You can use your favorite ingredients in this rub, from dried spices to fresh herbs to the zest of citrus fruit. What remains important is applying these flavors where they are most beneficial; this means under the skin. Starting where the leg connects to the body, slip your hand under the skin and loosen it as much as you can around the breast and body of the turkey. Push your turkey rub into this space and spread it out evenly. Work the rub into as many meaty areas as possible, as well as the body cavity. As the moisture from the bird mixes with the rub it will steam the inside with flavor. The smoker consistent temperature for the duration of the cooking time is very important. You can smoke your turkey anywhere between 200 and 275 F/95 to 135 C. There is no real benefit to cooking at a lower temperature than that. You can cook at a higher temperature, but anything above 275 F/135 C isn't going to give the smoky flavor and tenderness you would want from a smoked turkey. Your turkey will cook slower at higher elevations and weather will play a big role in the cooking time. The type of smoker used also changes times and temperatures. You may need to adjust the cooking temperature up or down to hit upon your dinner time (also plan on an additional 15 minute rest time before you carve). At 235 F/115 C, your turkey will take 30 to 35 minutes per pound. At 250 F/120 C, your turkey will take 25 to 30 minutes per pound. At 275 F/135 C, your turkey will take 20 to 25 minutes per pound. Place the turkey in the smoker where the smoke can flow evenly around all sides. It should be placed squarely over your drip pan so as can catch all the drippings (and help keep your smoker clean). If your smoker is an offset model or otherwise puts out more heat on one side than the other, then you will need to rotate the turkey every two hours to make sure the bird cooks evenly. When oven roasting a bird, it is a good idea to cover the breasts with foil during part of the cooking time. This is to prevent the skin from burning or drying out. Since smoking takes place at a lower temperature this won't be necessary. With the turkey on the smoker, now is a good time to clean everything to prevent cross-contamination with anything that has come in contact with the bird. With the smoker hot and the bird on the cooking grate, it is time to build up a good dose of smoke. Meats absorb more smoke early on during the cooking process than it does later, so now is the time to get the smoke going. Any wood (except maybe mesquite) is a good choice for your smoke. If using large wood chunks, you don't need to soak the wood. If you are using smaller wood chips, soak them first. This slows down the burn rate and gives a longer, more consistent smoke. Make sure you shake off as much water as possible. Wood chips should be damp but not dripping. Once the wood is placed into the smoker, close it up and watch the temperature. Unless you need to rotate the turkey during the cooking time there isn't any reason to open the smoker for several hours. Keeping the smoker closed holds in the heat and the smoke, so don't waste it by opening the smoker excessively. If you want to baste your smoked turkey, wait until the last hour of the cooking time to begin. The ingredients for the baste depends on your preferences. Adding some sweet to the baste gives the surface of the turkey a candied flavor. Apply the baste onto every inch of the surface of the turkey, including the insides. If you want to do a lot of basting, double my recipe and repeat after 30 minutes, giving the first coat time to sink in. As the end of the cooking time nears, you need to check the temperature. A turkey is a complex collection of meat so checking in one place isn't going to do it. You need to check both sides of the bird and in both the white and dark meat. Look for the center of the breast and push the meat thermometer into it, but avoid getting it on the bone. Bone heats faster than meat and will give you a false reading. Next, check the thigh between the leg and the body. Now do the same thing on the other side. The lowest reading is the one you use. You are looking for an internal temperature between 175 and 180 F/80 to 85 C (this isn't your final temperature). When the lowest temperature on the bird reads this temperature it is time to get the turkey out of the smoker. Make sure to have a large platter or cutting board and some aluminum foil ready. Resting is the secret to juicy, tender, properly cooked meat. Resting allows the heat to even out (bring up the cooler parts and cooling off the hot spots) and, most importantly, lets the meat relax. Under heat, meat contracts and squeezes out the juices. By letting the meat rest before you cut into it, the meat can reabsorb some of the moisture. For a ​full-sized turkey, the resting period should be about 15 minutes. Make sure to tightly cover the turkey to hold in the heat and moisture while it rests. Put it someplace warm and without a draft so that it can rest adequately. Once the resting period is over, you may start carving. If you are running early and need to let the turkey rest longer than 15 minutes, cover it with some kitchen towels for added insulation. The heat of the bird will keep it warm. When you are ready, remove the covering and start carving. Can I Brine My Turkey and Use a Rub or Injection Marinade?